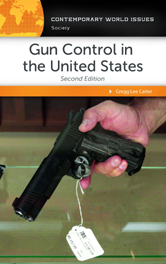 This book offers concise, understandable coverage of all aspects of the issue, including incidence of gun violence; gun control; gun rights; government regulation, legislation, and court decisions; gun organizations (for gun control and for gun rights); gun enthusiast subcultures -- for example, hunters, target shooters, and collectors; and U.S. attitudes toward guns. Many of the covered topics are placed in historical and cross-cultural perspective. Do Americans Want Strict Gun Control? Is the Will of the People Being Thwarted?